Augment sales revenue by the increased number of completed orders. Automatically send catchy reminders. Enhance customer loyalty by offering discount coupons. Every abandoned cart is a missed opportunity and lost revenue. According to the latest statistics, more than 70% of customers abandon their carts. It means that 3 out of 4 customers never return to finish their orders. Magento 2 Abandoned Cart helps effectively turn lost purchases into completed orders by sending smart automated reminders with or without a discount coupon. Magento 2 Abandoned Cart Email allows you to send automated triggered reminders to visitors who left your store without the purchasing. Due to this user-friendly tool, you’ll be able to effectively recover abandoned carts, thus, significantly boosting your conversions. Due to a high flexibility the module lets you set up rule conditions based on different parameters (e.g. conditions combination, product attribute combination, products subselection, and cart attributes). Choose a ready-made template and customize it by adding store contact information and specific variables. Easily configure rules for your email dispatch. Just choose a delivery time and select a discount amount for your coupon. Set up your test email campaign to make sure that everything works correctly before starting a mass emails sending. Analyze and wisely manage your Abandoned Cart Email campaigns with an accurate statistical data visualized on Abandoned Cart Reports. Maximize profits by constantly improving your campaigns based on the data gained. Make sure your abandoned cart emails were conveyed and didn't get into spam with our Magento 2 SMTP extension. Cron job and Google Analytics to take pleasure in working with the extension. We are ready to help and answer any questions regarding our products, services. We optimized the performance to send emails in bulk without affecting your site speed, included files log, API and multilingual support, flexible scheduling and email automation, as well as debug mode to make sure everything is set up correctly. The extension goes with a built-in spam rate checker for emails dispatch, ready-to-use copies and mobile templates. We always strive to supply customers with desired features. Thus, choosing this extension, you will regularly receive new updates. First-rate functionality and timely support.The tech team helped me a lot with the installation. There are no conflicts with other extensions. It's worth purchasing. The plugin does what is said. I use it with the Follow up plugin and send emails to each customers' group with conditions. However, the templates design could be a little multivarious though, it's really highly customizable. The module is crammed with this, that, and the other options but fun to use. I've installed it, customized the templates and...voila, started new email campaigns. Had it with another email extension by Amasty. It is fine and all the rules are working just properly. There was an issue with a coupon code, but the guys from support were brilliant as usual - we easily figured it out. – New: the ability to manage all existing cron tasks on a Cron Tasks List grid in backend was added. Run cron tasks and generate their schedule by clicking the ‘Run Cron’ button. Also, delete tasks in bulk, use filtering and sorting options when it is needed. 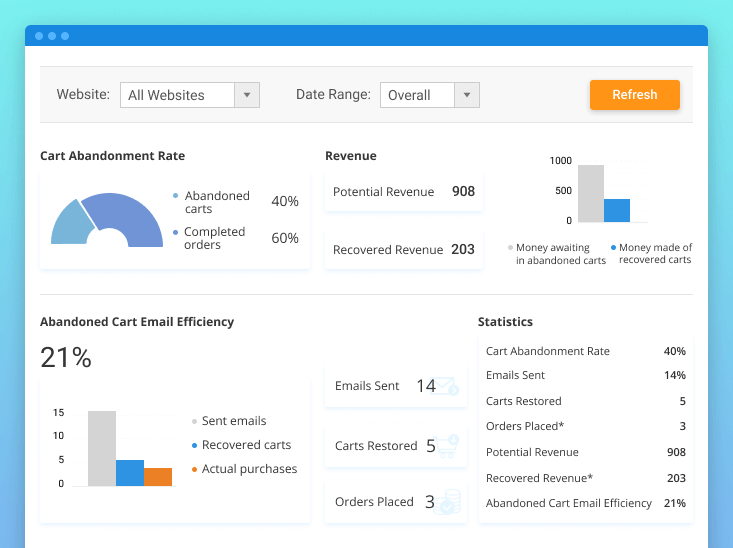 – New: now you can get valuable insights on your cart abandonment rate and abandoned cart emails efficiency via reports. – Improvement: now, in addition to scheduled time, you can see date and time when your abandoned cart email was actually sent. – New: Information section is added. Now you can see the version of installed extension, available updates, User Guide link, conflicts and other useful data right on the module Configuration page. – Fix: the issue with Customer Group and Store conditions was fixed. – New: now the extension can re-send the previously sent coupon in subsequent emails instead of generating a new one for each email. Please look for 'Send the Same Coupon Again' checkbox on Schedule tab. – New: introducing the 'Automatically remove sent emails from History' feature which is designed to clean up a log of sent emails and free some disk space. – New: 'Reply to' headers added to email configuration. – The issue with backend design on Magento 2.2 was fixed. – The blacklist behavior was fixed. – The logic of the email queue generation was improved.